Today we are talking about making your guest posts GREAT by using screenshots! Images increase your chances for approved guest post: A blogger is likelier to like your guest article if it appeals to an eye. Images make social media shares much more engaging. As an example, it has been proved that tweets with visuals increase engagement (retweets) from 90% to 150% (based on different research). Images are grabbed by Facebook and Google Plus to show in the social media update. Images make your article “pinnable”. The visual web is definitely the future (Look at multiple visual startups). We still have our visual contest going and one of our participants wanted to us to publish her case story here – which we are glad to do! Please meet Anna aka celebsfan at MyBlogGuest. 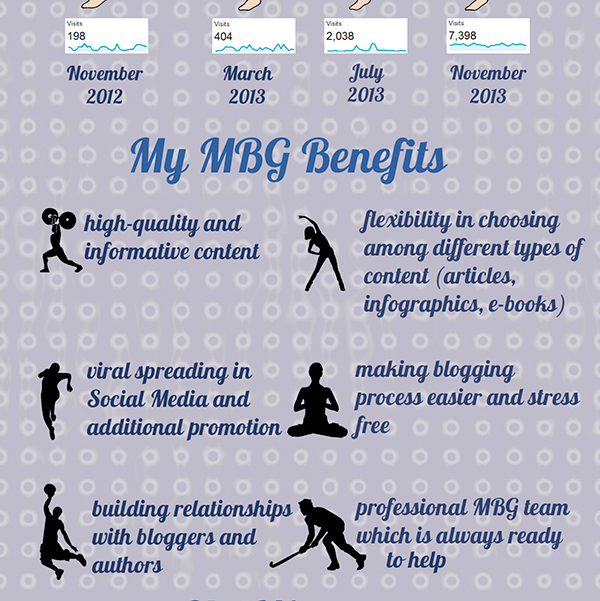 She runs a couple of neat niche websites and she uses MyBlogGuest to feel the gabs in her editorial calendar. One of her sites fitnessstatistics.com hosts our Infographics and Guest articles on a regular basis and looks like Anna had huge success with it! I don’t know; it may be true but for content marketers and (guest) authors it’s an invaluable tool! My Blog Guest is four years old this year. It’s hard to believe! 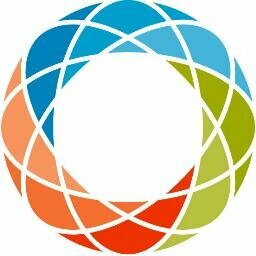 We are seriously thinking about redesign that’s badly needed. We’ve been adding so many features that we couldn’t afford the time to beautify them! 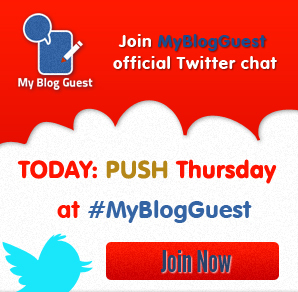 My personal New Year’s resolution is to make MyBlogGuest neat in 2014! 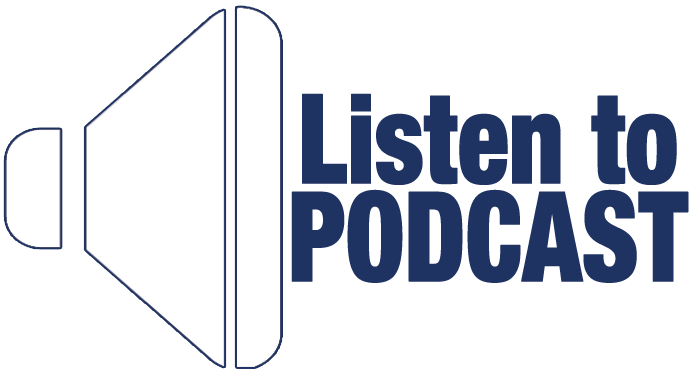 Here’s our thinking behind the new logo: We wanted something sleek and minimal while preserving the traditional concepts of creativity and collaborating. Happy winter everyone! 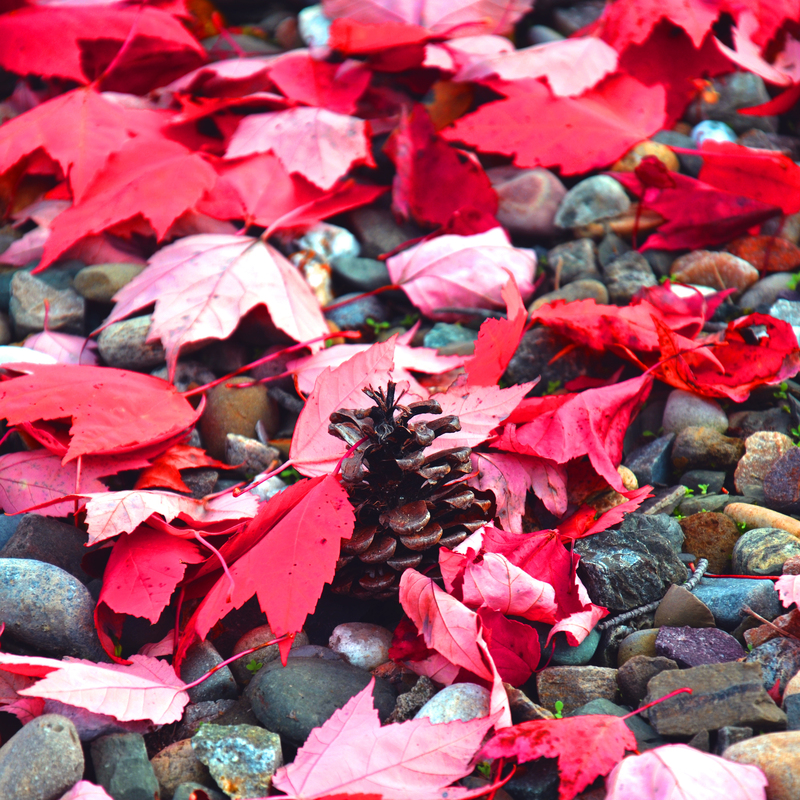 In this roundup we’ll list some of the latest autumn guest posts published via the forum. Please don’t forget about our contest! There less than two weeks left till it ends, so hurry up and get your prize! We are waiting for your entry! 1. Roadside Blood Alcohol Testing By EMTs: Slam Dunk Or Fatally Flawed? (over at lawfuel.com): Holiday season is just around the corner, so Kimberly Diego of diegocriminaldefense.com begs you to be on the safe side and drive carefully. 2. Kitchens & Colour & The Art Of Having Both (via memetics.com): Planning some renovation? Be sure not to miss this great article by Molly Hilton of renaissancepainters.ca and you may turn your kitchen to a real masterpiece. Reminder! MyBlogGuest contest for best visual success story is on and running! It’s on the half-way already, so you still have time to bring your story to us, and win! Today we are having our PUSH Thursday! Hope you enjoy this selection of 10 guest posts published this month! 10 Ways To Promote An Ebook -It’s good to know what to do with your infographics! You don’t have to use them all – but they are definitely worth considering. How Marketers Can Create Stunning Infographics – three tools for building infographics online with short descriptions and links to each. Check them out! Are you ready for our November 2013 MyBlogGuest Google+ Hangout On Air? It is coming up, Friday, November 29, 2013. Google helps us out by providing the time in our own time zone. If you click on the event, above, you will see what time it is in YOUR time zone, based on your Internet Service Provider. You may also manually check your time zone here. 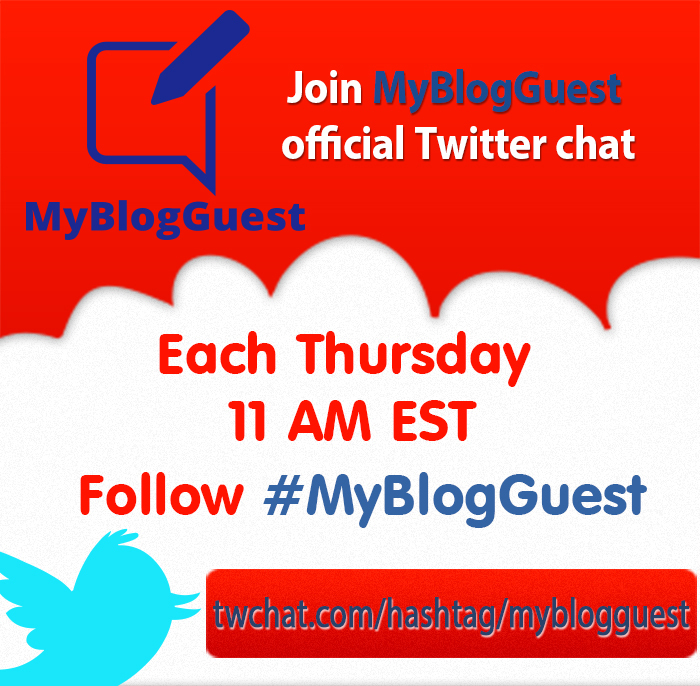 Beginner Bloggers: How #MyBlogGuest Helps New Bloggers. How to Track Your Guest Posts on Social Media for More Exposure #MyBlogGuest. #MyBlogGuest Social Media Networks: Join to Build Your Community. Yesterday I was invited to host #AtomicChat (courtesy of Atomic Reach) and talk about guest blogging. Obviously, I was happy to jump in (you can’t get me shut up if you ask me to talk guest blogging, so beware). The chat was awesome and I thought I’d better re-use my prepared answers with our own community too! Note: These are just my answers and a few selected tweets; it’s not the full script. The actual chat was much MORE active! 1. What is guest blogging? I had a great Sunday. Can you imagine the feeling when you are a business founder, and you see people coming to your site from Forbes, so you do [site:forbes.com your business name] search on Google and not only you find a cool unexpected mention from Forbes contributor saying how cool MyBlogGuest is for marketing but also come across a nice random comment from a user praising your team efforts in yet another Forbes article? 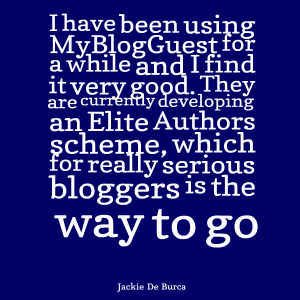 For those of you who are looking to find niche sites to guest blog for, I have been using MyBlogGuest for a while and I find it very good. They are currently developing an Elite Authors scheme, which for really serious bloggers is the way to go. 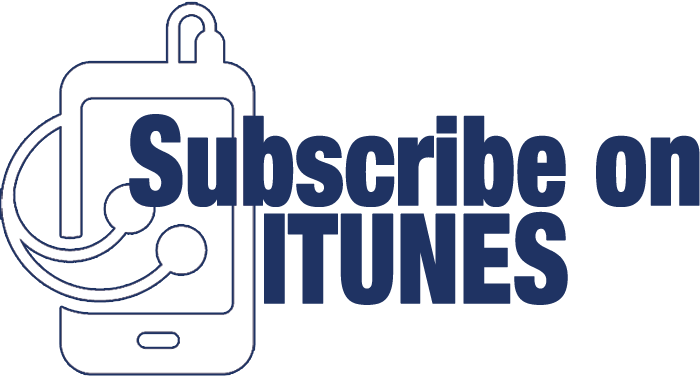 Posts via this system get editorial recommendations from the team, which are very helpful. 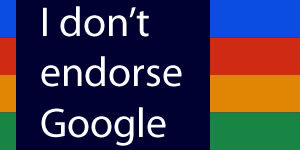 These posts should only have one relevant self serving link plus a link to your google+ profile. They should also have some non self serving authority links. There are a couple of things that we understand about SEO, one is that to rank you need to get some links to your content: the more, and the better the quality the better your chances. We also know that doing a little bit of old-fashioned on-page SEO can help things along. Sure, if you really go all out on the link building you might force your “so so” content onto page one, but it probably won’t stay there for long and you’re just as likely to get your website penalized instead. 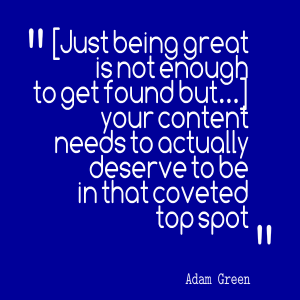 No, now-a-days the single most important thing is that your content is great; In short, your content needs to actually deserve to be in that coveted top spot. Get that bit right and the supporting activities (like link building) suddenly become more of a “helping hand” and less of an uphill struggle. Ok, so the fact that you need to write good content isn’t exactly a new idea, but in this post I am going to talk about how you actually go about creating that content. It’s not fool-proof, but if you have a system your odds of success are that bit higher. 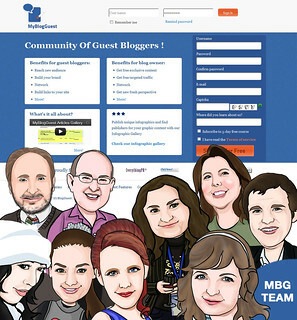 MyBlogGuest.com is the free community that connects blog owners to guest authors for mutual benefit. My Blog Guest was founded by Ann Smarty. I've found the Article Gallery to be the best guest blogging resource on the net right now. It's easy to find posts (if you are publisher). It's also great if you have posts that you need published on quality blogs.